What do you do when the weather is beautiful outside but you have to work all day? Take a mini-vacation at lunch time, of course. I was disappointed, but something two doors down caught my eye. 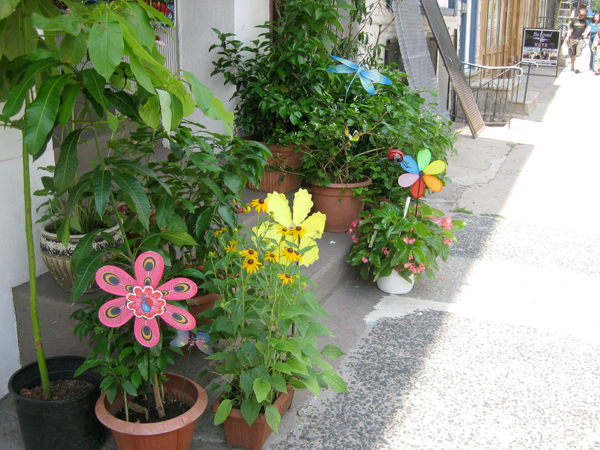 Plants and flowers were set up in pots right on the sidewalk with colorful pinwheels and doo-dads decorating them. What was this place? I’d walked this street dozens, if not hundreds of times and never noticed it. I paused, about to take out my camera to snap a photo or two, and saw a small Asian woman had come down the steps and was bending over the plants. She smiled and waved me over. “Is this a shop?” I asked. The tiny space inside was packed with one-of-a-kind jewelry (her husband’s designs), paintings (both her and her husband’s), sculptures (hers) and pottery (her husband’s) as well as tons of jewelry and statues and knicknacks from Thailand, where she told me she was from. As I was looking over one of her paintings, a large purple and yellow piece with what (to my untrained eye) looked like an image of a Thai deity, she invited me to the back to see her studio, an even smaller space that she shared with her husband and had crammed full of sculptures, works-in-progress and a large TV. “I like to watch the news while I work,” she told me. She briefly pointed out what was hers and what her husband was working on, but what she was most enthusiastic about was what she called the Peace Project. 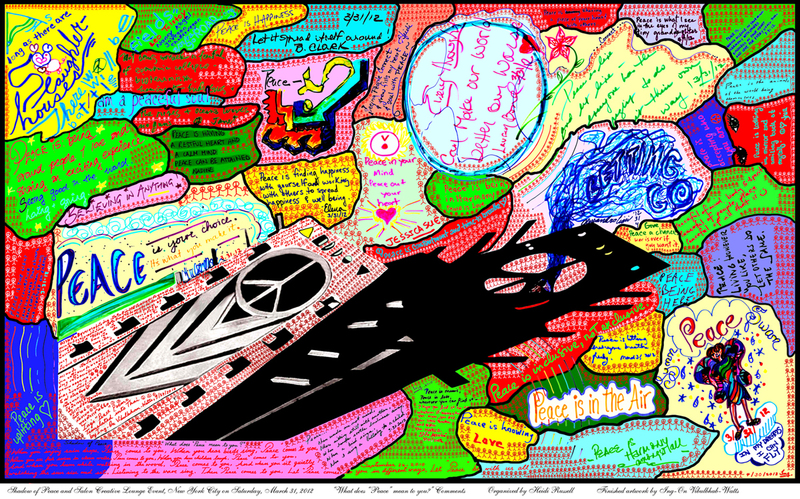 Half a dozen prints of a large peace sign throwing a shadow over the landscape, filled with quotes, scribbles, doodles and sayings made by Newark students, teachers, friends and others. She showed me several prints, each filled with quotes from a specific group or school. The one at left was for an exhibit at Salon Creative Lounge in New York City (the photo links to more information). She was very passionate about it. Her entire face would light up when she imagined what it would be like if each teacher would start the school year asking their students what peace looked like to them. “It only takes ten minutes, once each year. But imagine what would happen if our children began every year thinking about peace for 13 or 14 years?” And not just children. Adults. What if we all spent just ten minutes thinking about peace every year? As I was leaving I snapped a few photos of the plants that had first drawn me in. She came back outside, and pointed to the tallest one. 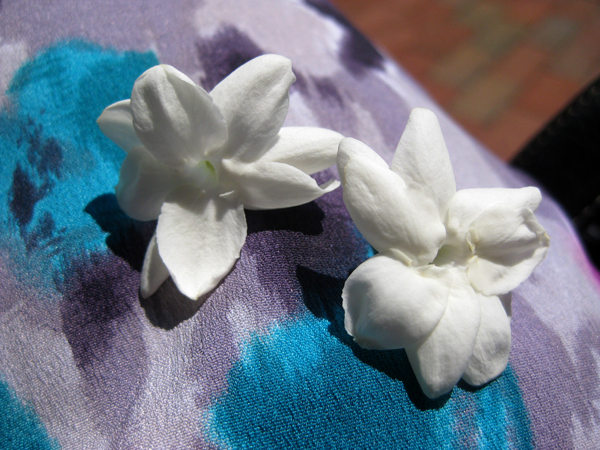 “It’s avocado,” she said, “I planted it from the pit.” “This one is jasmine,” she said, and when I told her I love the smell of jasmine she plucked two delicate little blossoms and handed them to me. The perfume alone was like a mini-tropical vacation. I told Ing that I would share her project, so I’m passing along her question to all of you. What does “peace” mean to you? Posted in other people's cool stuff and tagged art, newark, nj, peace, shadow of peace. Bookmark the permalink.